For more than 30 years Ayyad Baumaschinen stands for the respectable trade with high-quality construction machinery and vehicles. 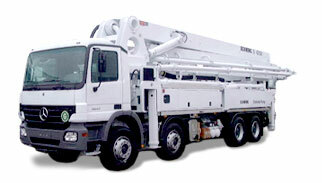 Our offer consists of new and used concrete pumps, concrete transport mixers, trailer trucks and excavators. Among other vehicles in our permanent range, we also offer a wide choice of passenger cars. Beside field-tested complete solutions or the realisation of individual customer wishes we tender a maximum in service and consultation.